JEFFERSON CITY, Mo. 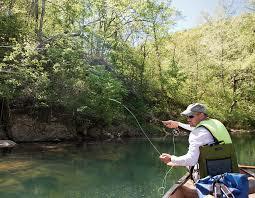 – The Missouri Department of Conservation (MDC) will offer an opportunity to float a Missouri stream and learn paddling and fishing techniques on July 14 on Missouri’s Big Piney River near Licking. Participants will learn basic kayak paddling instruction, as well as basic fishing training before embarking on a float that will last the majority of the day. MDC will provide all kayaking and fishing equipment, as well as transportation to and from the river. Participants ages 13 and older are welcome, though those younger than 18 must be accompanied by an adult who also registers for the program, and participants older than 15 must be properly licensed to fish. Participants are encouraged to wear swimming clothing or clothing that can get wet. Also, participants should bring a towel, sun screen, bug spray, and a change of clothes for the ride home. Closed-toed shoes are required. Participants should also bring a small cooler with lunch and enough snacks and drinks for an all-day float. Alcohol and beverages in glass containers are prohibited. Participants will meet at Runge Conservation Nature Center, 330 Commerce Drive in Jefferson City, at 7 a.m. on Saturday, July 14, and will be returning by about 8 p.m. Return time is subject to change based on river conditions, weather, and other uncontrollable factors.